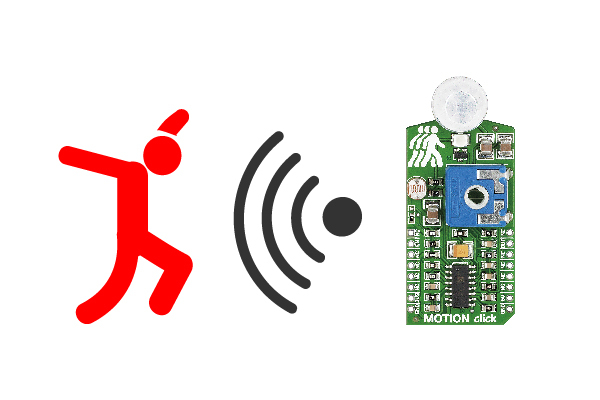 MOTION click is a motion detector sensitive only to live bodies. It carries PIR500B, a pyroelectric sensor which generates a voltage when exposed to infrared light. The signal is processed by a BIS0001 PIR sensor controller which sends an interrupt to the MCU through the mikroBUS™ INT (out) line. An onboard potentiometer lets you adjust the detecting range of the sensor (up to 4 meters). MOTION click also has a night only mode—resoldering a zero-ohm jumper activates the onboard photoresistor which acts as a light-sensitive switch. You can also switch the sensor ON and OFF by sending a signal from the MCU through the mikroBUS™ RST pin. The board uses a 3.3V power supply only. MOTION click is ideal for alarm systems, light switch controllers, and similar systems where human presence needs to be detected. Measuring distance of a magnet from sensor (suitable for industrial controllers, joysticks, or any other applications for contactless linear or rotary position sensing). Sensitive only to live bodies. Onboard photoresistor for night-only mode. Designed to use 3.3V power supply only.